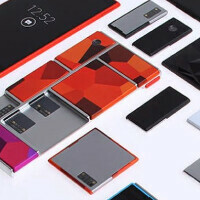 Remember Project Ara, Google's concerted effort to create a modular smartphone with swappable components? An idea that was once frequently in the news, we've heard little of its progress in quite a while. 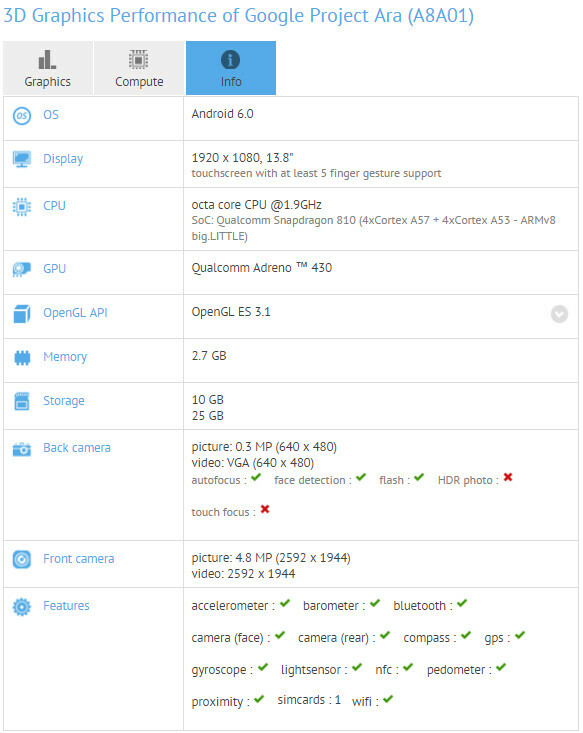 However, GFXBench has potentially uncovered a device-in-testing, which takes the form of a full-HD tablet. The notion of a modular mobile device is a greatly appealing one for a number of reasons. Every year, smartphone owners can feel inclined to spend hundreds of bucks on a newer model when, almost always, changes are minimal at best. With Project Ara, a user would be able to switch out a processor or camera component as easily as a microSD card, and potentially upgrade the same base unit multiple times. We probably won't see our first Ara handset until later this year. The Ara team indicated recently via Twitter that the first handset would debut in 2016, and if there is to be any news on the matter, it's almost certain that we'll hear about it at the I/O dev gathering in late May. As you can see from the specs, it's a full-HD affair, though spread across such a canvas, wouldn't be incredibly sharp. The processor aspect is taken care of by Qualcomm's Snapdragon 810 SoC, which caused some controversy last year thanks to reported overheating issues. In the future with something like Project Ara, a problematic processor could be as easy to switch as a screen protector, and should modular smartphones ever become a Thing, the smartphone game as we know it would be completely turned on its head. Identified as Google Project Ara (A8A01), the slab runs on Android 6.0 Marshmallow. There's no telling whether such a device is ever to be released, since benchmarks only offer information on specs. We'll surely know more by the time I/O comes around. Do you think modular mobile gadgets are the natural progression from today's devices? Let us know in the comments! A 14" tablet running android with a 1-year-old processor... Is Google out of its mind? Did you miss this: "With Project Ara, a user would be able to switch out a processor..."
But what is the point there are always only 2 top processors on the android front every year. Just give me the best specs for the best price. I was interested in this originally but I fail to see how this benefits me without pc like hardware options. Agreed, I still wouldn't even consider this ARM tablet unless it can be upgraded to a Surface Pro at least. I'm hoping an Intel Core would be one of the CPU modules. We are not talking Windows or OS/X here. We are talking Android which is an agnostic platform. It doesn't matter if your processor is ARM, x86, or anything else because Android takes you away from all that. Android apps can run on any ARM based processor, MIPS, or any Intel or AMD processor. The only reason why project Ara came to be was Android was a full fledged agnostic platform. It's only recently that Apple and Microsoft want to follow in these footsteps. Apple with their Swift language and runtime, and Microsoft with their Universal apps and runtime. Both are trying to follow in Androids agnostic approach. However Android has 1.8 million agnostic apps. MrElectrifyer you talk it being a Surface Pro with an Intel Chip. There is nothing stopping Ara from using an Intel processor. Well except for power consumption, heat, and size. Although Intel has improved over the years. ARM has also improved as well. ARM sell more processors in one year than Intel does in 5 years. You are forgetting that Android is based on Linux and now supports way more hardware that both Windows and OS/X by a mile. It's because of this versatility that Android and Linux have taken off. You are forgetting that both Microsoft and Apple have become more closed with their OS's as time marches on. Only a handful actually have the ability to actually add anything to their respective operating systems. Windows use to be more open, but we all know that has changed. The joke is on you if you think Android is a joke on tablets. Considering their is way more touch centric apps for Android, then there is for any Windows tablet. You are talking about modules that you have no knowledge of what so ever. You are using assumptions, which is proving to the world your lack of knowledge. "As for Windows being less open, not sure WTF you're talking about.". Wow, you like proving to the world how ignorant you really are. Does anyone have access to Windows 10 source code? Nope, only Microsoft and even then only a select few actually have access to Windows 10 OS code. You want more proof. Look at Windows 10 IoT. Windows only supports a tiny few boards. Whereas Linux and Android support thousands. You must be living in the past. You keep talking this mile talk, but we will wait when the mile means something to consumers. Custom made chips and one offs, do nothing for the consumer grade, professional? sure, my router is probably running some form of Linux, but don't expect that Linux core to start running angry birds anytime soon. Android apps while they can run on anything because of being in Java...I cannot take an android apk, throw it in Linux like Ubuntu and call it a day. Good luck. You still need the middle man. You will either have to install a distro that supports the hardware you are using or do some rebuilding. And not all Linux are the same. At the end of the day...if x86 hardware was so simple and cheap for a phone, they would simply have thrown it in the mix. You still need specific code for OEMs because they skin the hell out of it or change it to the point, that I cannot download a nightly and throw it on my amd chip without some work to be done. However I can take my windows and throw it on any x86/64 chip with ease, the only standard for desktop. Only recently has windows even needed ARM. Touch Centric doesn't equal tablet optimized dummy. Android tablets just use a blown up version of SmartPhone optimized apps. There's probably way more tablet optimized apps on the Windows Store than the entire Play Store. Regardless of that, there's really no exclusive benefits to Android tabs as everything they offer is just an emulator away on Windows Tablets. There's a reason Samsung is switching to Windows 10 on their Galaxy Tab line... Regarding the modules, ever heard of deductive reasoning? WTF do you think the modules are gonna do in the first place dummy? They're just for future-upgrading components of the device. No need for them if none of them can make the device better than a Surface Pro, best tablet on the market IMO. What does having the source code open do for consumers besides having OEM-side customization? Which itself further delays devices receiving OS updates and also locks-in bloatware with most OEMs? The security part definitely holds no water, having a few ambitious devs coding for an OS is nothing compared to having an organization of 100,000+ devs working on it. So, what other benefit does it bring that Windows is currently missing out on compared to Android? It's an Android tablet not an Android high-end smartphone. So it is quite natural. Samsung did the same with its high-end S series tablets. Only Apple fits a more powerful processor to iPad than iPhone. "Is Google out of its mind?" You just now figured this out? Yawn give me a surface phone running full windows 10 all metal build with bluestacks. With that back camera specs. What the heck is google thinking?! First, it's a giant tablet. Second, Project Ara will let you swap the cameras for a better one, or even for something that isn't a camera. Google is becoming directionless.... Gradually missing vr and ar race; list the tablet race to Windows... What's next? You do know that Android still sells more tablets than Windows and Apple. This is 100% a fact. It's only because Android is totally free that Microsoft had to make their OS free for certain sized devices. What's to stop Microsoft from changing that back in the future again. "Free", at the end of the day, my tablet does more work than my comparable android tablet. Android sells more, because well I can get one with my bubble gum out the door at walgreens, that doesn't make it awesome. I remember the return rush on the polaroid android tablets. Lets not forget the carrier give aways etc. Sales do not always mean the better product. Isnt that what Linux has been ragging on about windows for how long now? Which could probably be easily done since everything is swap-able. I think it would be great if I could customize many specifications of the tablet to my liking. Don't know if it will be commercially viable, though. That's a tablet size I could work with. Still looks gimmicky. I'm not convinced at all on the modular concept. For me the problem becomes...at what point is swapping parts no longer worth it. Is it the same price to simply buy a new device every two years? Will that 41MP camera add on be 300 bucks? or 40?